The bikers tearing down those signs are simply participating in civil disobedience. They are the Rosa Parks of mountain biking, just making a stand against unfair treatment from The Man. We should march against the unfair treatment and hypocrisy of the DFW. I seriously doubt that they have the budget to patrol and ticket for the long term. I see from various media outlets that you are in some way responsible for the Calaveras Highlands property. 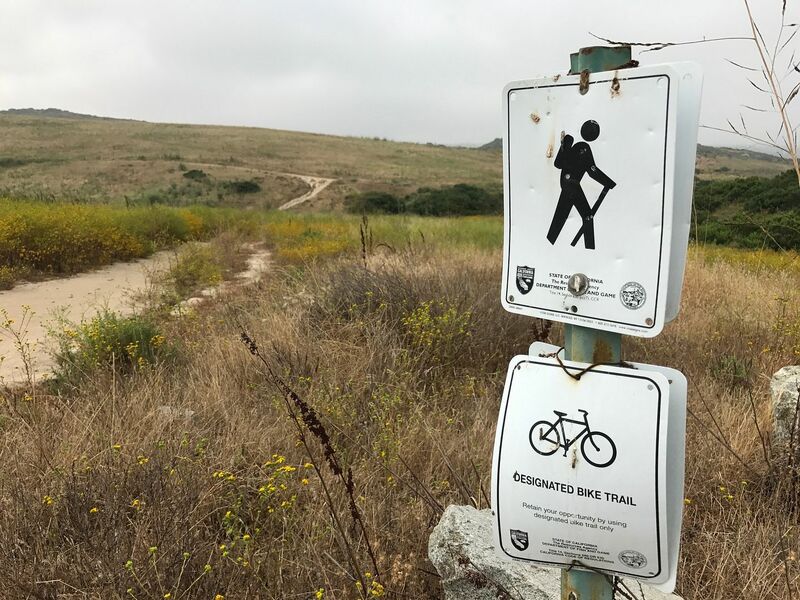 As a concerned Mtn Biker who lives only 5 minutes from this property I would like to ask what can be done to work with CDFW to gain legal trail access for Mtn Bikers? As you know this parcel of land falls right in the middle of hundreds of thousands of homes, with Thousands of citizens that enjoy Mtn Biking and nature. Most will agree that the trail network on the property is overly extensive and quite often trails fall into disrepair and someone decides it’s easier to cut a new trail. You may not agree, but the reason this occurs is because of CDFW’s own rules. If a realistic trail plan was developed, then HUNDREDS of Mtn Bikers would be at the ready to build, maintain and police the legal trail system. As it currently stands, there are probably a dozen or so people doing all the work and everyone else is just using the trails that are in good condition. Ultimately the only solution is to come to the table with ALL Trail users and agree to a realistic trail plan, which the Mtn Bike users would provide man power and stewardship to maintain. CDFW would ultimately gain, because you would no longer waste money on signage being destroyed, limited CDFW labor to “battle” a dozen or more builders and thousands of users. You wouldn’t need wardens to enforce a single user group when they could be looking for poachers or those destroying more sensitive habitat, etc. So please instead of going on a losing battle of trail enforcement, engage with the trail user community and develop a viable long term plan that will benefit everyone. I seriously doubt that they have the budget to patrol and ticket for the long term. After the 4th or 5th time they have to clean the spray paint off the big sign they will give up. There is no way they can re-coup in fines the amount of money they will waste. It is time for Fish n Game to work with SDMBA to get true land management and trail stewardship in place. If you take a look at the photos on that press release you will see a few of them are of old farm roads, created back when it was FARM LAND. Those Farm Roads are in major disrepair because Fish n Game has done ZERO land management since they took ownership in the early 2000's. There are a number of old farm roads out there that look like that. Guess what? All the trails that have been maintained by the mountain bikers are in great shape, wanna know why> The only ones Managing the land have been Mountain Bikers. I cannot agree with the building of new trails, but in the last 11 years I have only seen about 2-3 miles of new trails be created, most of the trails have been there in the last 11 years I have ridden the preserve. That press release by them is dishonest at best. Where is the new official Hiking Trail map? If all these trails are a problem, when will they actually designate official trails? When will Fish n Game go out and maintain the existing trails and protect the environment from further damage??? They have no plan, so they PLAN TO FAIL. Get out there and ride the stuff on the south side while we still can. We rode over there today and it's already getting crazy overgrown. If people just give up and don't ride there, those trails will be gone in 90 days. We started over by the lake and rode to the East, south thru the neighborhood and popped out of Cannon. Had to walk our bikes 1/4 mile to be "legal" and then popped out on all the south side stuff. Passed several riders starting out from Cannon and heading in to ride the South side on our way out. Didn't someone years ago say something like "Ride it until they pave it"? Mike, you sir are exactly right. My 11 year old alerted me to coverage of the Rosa Parks on Daily Dose of the Internet 3 days ago. See at 2:35.
huh... endangered plants and animals? Where did they come up with that lie? There are no Endangered Plants out there and the Gnat Catcher has a status of Threatened, NOT endangered. Very different legal status. Last edited by klurejr on Wed Apr 17, 2019 2:19 pm, edited 1 time in total. The post was to show how the world is looking at this. DDI is very, very popular among kids. I do not vouch for his accuracy!